Food, family, and pho. Also, the easiest authentic Instant Pot pho recipe around, probably. Make pho at home in under an hour. Like many Vietnamese families who escaped Vietnam after the war, my family was dirt poor and just starting over when I was growing up. The first month dad started a business, we only had $20 left over for food, so that month we ate nothing but instant noodles. I love instant noodles so never saw a problem with that situation then or now, but my dad always feels bad about it when the topic comes up. Food is really, really important in my family. When my mom was a young girl in Vietnam, she made a living selling food at the market, and always bought herself something different at the market to eat each day as well. Except for that one hard month, we had a tradition that every Saturday morning we would always go out for lunch as a treat, and that treat was almost always pho. Pho for 3, especially back in the 80s, was less than $10, and that made it possible for a young family to get out and have a little bit of fun in between all the hard work. And, just like my mom when she was young, each weekend we would go someplace different to try out their pho. A few years after Steph and I got married, we did pretty well and were lucky enough to be able to go travelling for a bit, and Steph insisted that we always try a pho place in each city we visit. 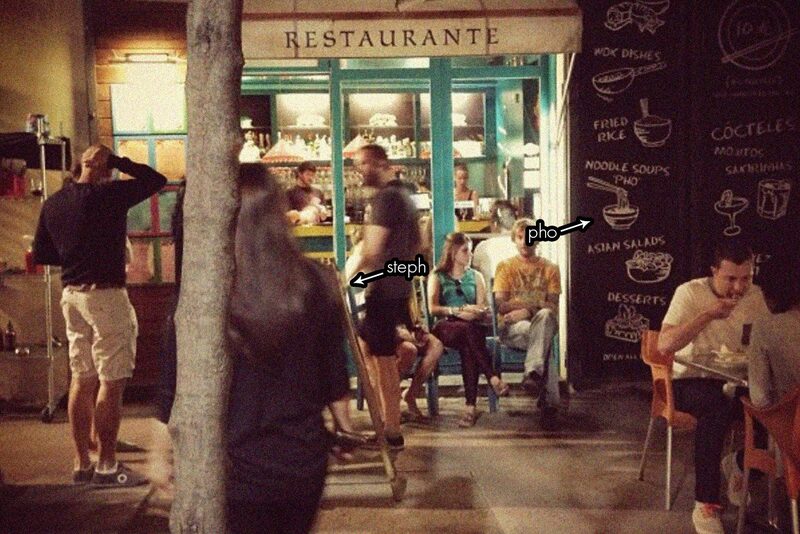 I’m pretty confident that I’ve personally eaten at hundreds of different pho restaurants with my parents growing up, and Steph and I have had pho in places as far and wide as Switzerland, Spain (shown below), Colombia, Singapore, Hong Kong, Tokyo, and of course, most any major city in North America. 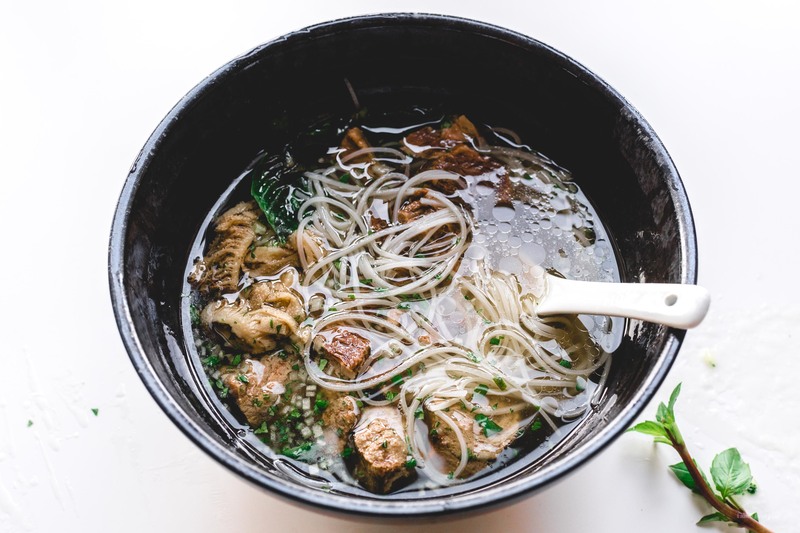 So, having established our pho credentials, you can trust this recipe to not steer you wrong, and anyone can make it – it’s pretty much the world’s easiest pho recipe. You need an instant pot, but if you don’t have one, just leave it on the stove and wait as your house fills up with the smell of slow braised beef. If you’re interested in geeking out about pho, here are some notes, but you can just jump to the recipe and make it instead. 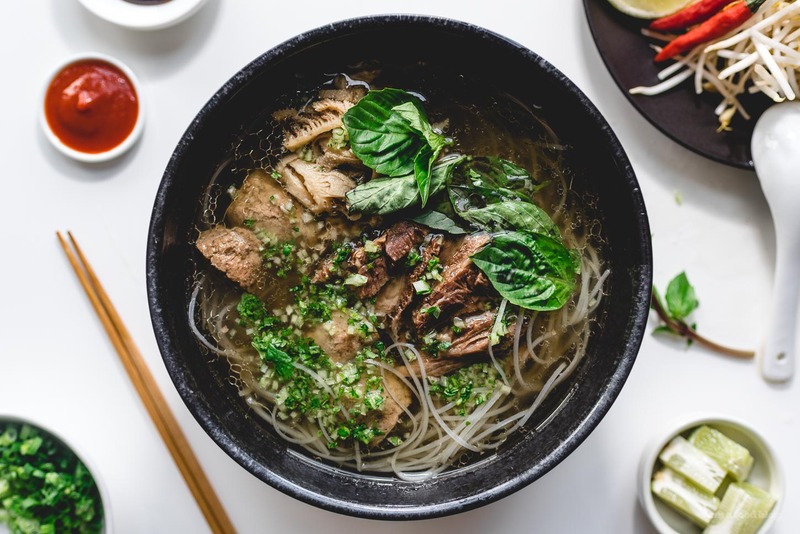 A good pho is a well made beef broth with charred aromatics, sweetened with sugar, and seasoned with fish sauce. Traditionally this was made with bones, but for this recipe we are going with a cheap cut of meat. 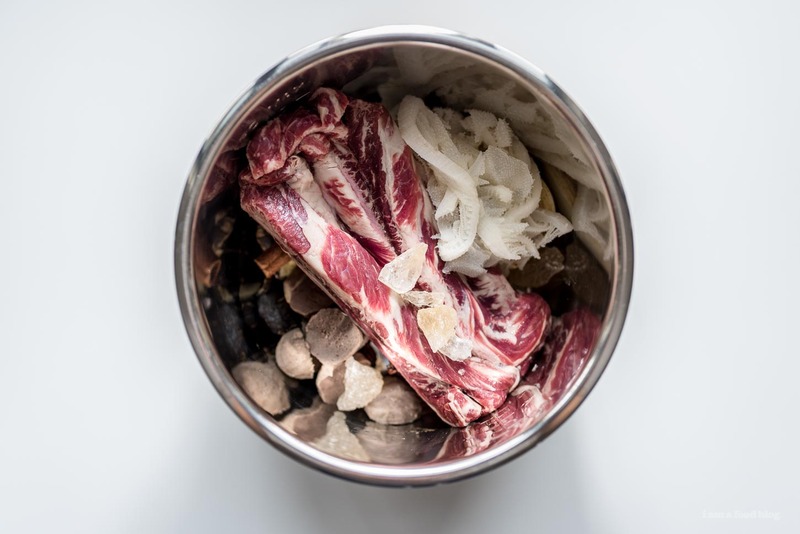 I’m a sucker for whatever cut is on sale, and lately we’ve gravitated towards a cut from the ribs called finger meat, which I feel has the perfect ratio of connective tissue, fat, and meat for an incredible pho broth. With such a simple recipe, what you put in is what you get out, and a cut of meat with some connective tissue and fat goes a long way. But really, any cheap cut of meat will do. Because it’s an easy pressure cooked recipe, we’re not going to par boil the scum away (because the low agitation of a pressure cooker means you’ll get a mostly clear broth anyway), but if you’re doing it on the stove top, boil the meat for 5 minutes at a rapid boil to agitate any scum out, drain the water, wash the pot, and refill with cold water to get a super clear broth. A note on fat content: Any good noodle soup needs fat for the broth to stick to the noodle and pho is no exception. If you prefer to control the fat content of your pho (and can wait a few hours before eating) this is a trick I learned from Ivan Ramen: 1. Leave the pho in the fridge until the fat solidifies. 2. Scoop it out into a small saucepan. 3. Melt it over low heat. 4. 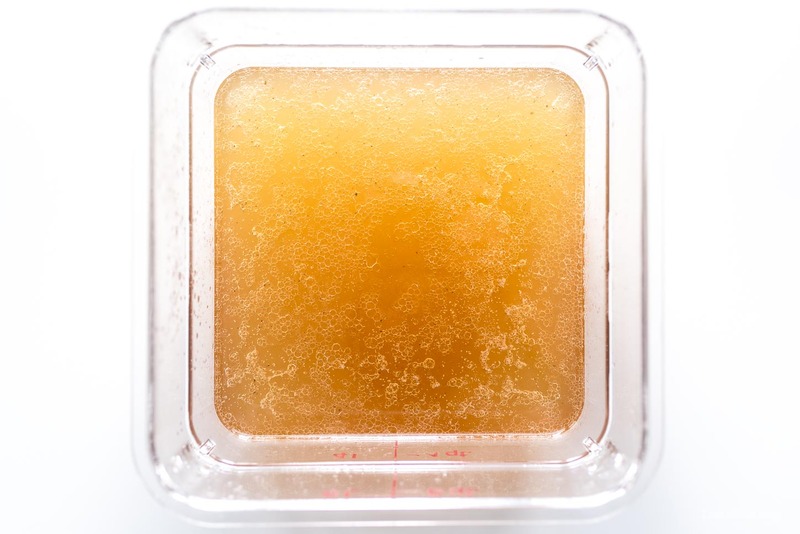 Strain into a small container. The fat will keep in the fridge for up to a week, and you can measure out exactly how much each bowl will have. Add at least a teaspoon to each bowl of pho you make; unless you’re crazy about living fat free, your tastebuds will thank you for it. We do this when making ramen, but for pho we just go with whatever fat is in the meat we use. 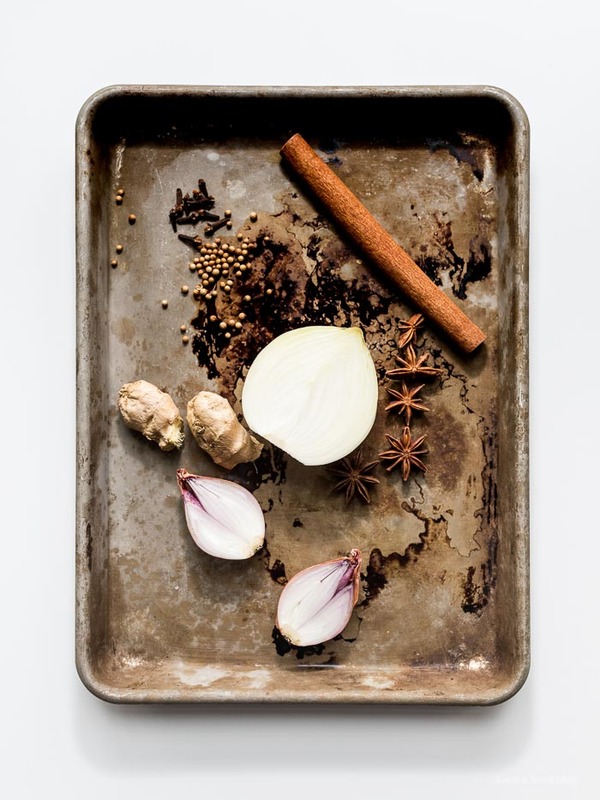 Charred aromatics are the key to a great pho, and the easiest, most lazy way to char your aromatics is by putting them all on a sheet tray and blow torching them all at once. I like to use a mixture of ginger, cinnamon, cloves, coriander seeds, star anise, shallots, and onions. If I’m making the pho just for myself (as in not even for Steph) I’ll double the star anise, but that can be off-putting to some. You should seriously consider getting a good blow torch if you don’t have one because they are cheap and insanely useful, but you can also char over a gas range, on an outdoor grill, or under the oven broiler. If you are charring over a gas range, just char the ginger, onions, cinnamon stick, and shallots. Pho is about balance, but not necessarily subtlety. Personally speaking, I like my pho to be extra, so any pho I make right out of the pot will seem too sweet. Adding the fish sauce will counter balance the sweetness, and the customary squeeze of lime at the table will bring the brightness to offset the umami bomb you just made. The recipe below is a middle ground sort of sweet, but if I made it just for me I’d double that amount of sugar. The sugar it calls for is rock sugar, which you should be able to get just about anywhere, but if you can’t, brown sugar will do in a pinch. Rock sugar is prettier though. Not all fish sauces are equal, and you really do get what you pay for, especially when you can never pay more than $10 or so. You don’t necessarily need super high end Red Boat brand, but if you’re at the supermarket and see something called nouc mam nhi, go for that one, it’s basically the equivalent of first press or extra virgin fish sauce, and is always a good bet. If you can, get fresh pho noodles, but if you can’t, the dried stuff works too. Sometimes the noodles will be called rice stick or Thai rice stick noodles. Medium thickness is best. If you’re using dried noodles, soak them one hour to overnight and in either case, let the heat of the broth cook both the fresh or dried noodles. Pho is beloved not just for its broth but the meaty toppings. Sirloin, well done brisket, flank, tripe, meatballs, the list goes on and on. 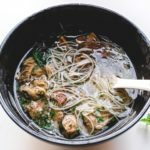 Anyone who has been eating pho for awhile will tell you that dac biet (which is every meat the restaurant has) is the way to go, and it’s what I order in a restaurant, but at home, you may not want to go that nuts. For me though, a good pho should have 2-3 different meats. If you make this with finger meat, flank, or brisket, you should have some nice well done meat, and to that I’d recommend some beef meatballs, either homemade or from a Vietnamese deli, sirloin that’s been thinly sliced and allowed to cook in the broth (buy sirloin roast to get the nice round pieces), and, for the truly adventurous, omasum. Warning: don’t google ‘omasum’ unless you know what you are getting into. Thai basil, jalapeños, and limes at the table are basically mandatory everywhere, but we also like to have a dish of mixed chopped onions and cilantro, Mexican style. Hoisin and sriracha sauces are always welcome as well, despite what Bon Appétit said about that. I’ve never actually made pho for my parents because I’ve never felt it was good enough (and they have pretty strong opinions). I’ve been hyping up this recipe to them a lot though, and I think it’s going to be the one. Only thing is, it won’t be me making it because Steph has already stolen it for her own (she did the cooking in these photos) and plans to make it for our next in-law dinner together. I’m looking forward to it, and will update with my parents reaction. Stay tuned! 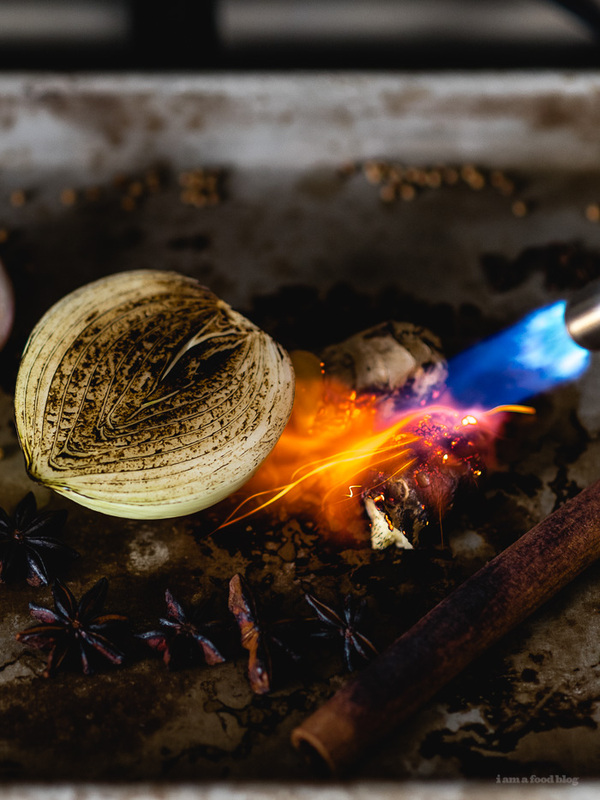 Arrange the onion, shallot, cinnamon stick, cloves, coriander seeds, and star anise on a heat proof baking sheet and blow torch until fragrant. Alternately, char on an outdoor grill, over a gas range, or in an oven broiler. Transfer charred aromatics along with sugar and meat to Instant Pot/Pressure cooker. Fill to the max fill line with water, about 4 quarts. Set pressure to high and cook time to 35 minutes and cook. Quick release the pressure when cooking time is completed. Once cool enough to taste, add fish sauce 1 tablespoon at a time until it’s just about overseasoned. If you go too far, just add water. You may optionally strain the pho at this point to get as clear of a broth as possible. 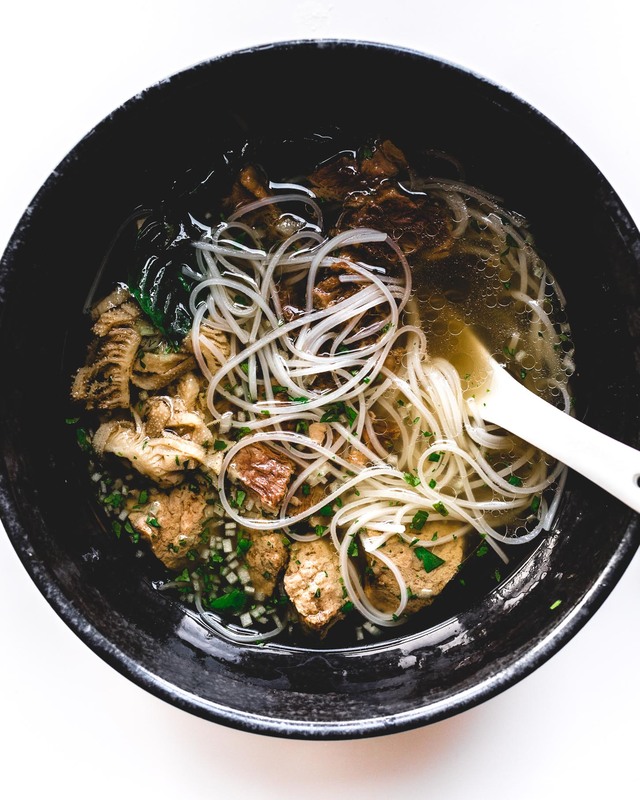 Place noodles and meat in a bowl and cover with hot broth. Serve with a plate of bean sprouts, limes, Thai basil, rough chopped onion and cilantro and jalapeno. Have small dipping plates of sriracha and hoisin sauces for each person. Notes: If you don’t have a pressure cooker, gentle simmer the beef for 4-6 hours. *We used finger meat in this recipe but the choice of cut is up to you. Maybe I’m missing something, but how much water do you add along with the aromatics/sugar/meat into the instant pot? That’s a great question, I completely forgot to mention the most important step! It’s 4 quarts or so, fill right up to the max fill line. Thanks for catching that. Thanks so much. Can’t wait to try it!! It’s incredible. It’s become: “what should we have for dinner?” “I don’t know, let’s make something with the Instant Pot” in our house. Highly recommended, there’s very little learning curve, at least the way we use it. I used pressure cooker for almost 60 years. Yes, I’m that old and I still cook from scratch. I never use the p. cooker for soup, where the flavours need time to get out off the meat. P.cooker makes it soft quickly. If you want the flavor to stay in , than use it. Very good to cook smoked meat, potatoes, root vegetables. Experiment with your time of cooking and do not force to open the pot under pressure. This looks so delicious! I’ve never tried cooking anything with rock sugar (I usually just ate it straight as a kid), but I’ll have to try this one out :) Thanks for sharing! I loved reading about your family, it reminded me so much of my parent’s stories of when they first moved to America from Hong Kong. It’s incredible how strongly a single dish can make such an impact on our families! I’m going to have to try out this recipe soon! Another tip for a clearer broth: natural release. Manually releasing the pressure will cause the broth to boil/agitate. I love Pho. Especially Bun Ga Hue. Could you enlighten me – what is added to make it spicy? What is the red the paste to make it specially spicy? I can’t seem to get that specific taste! Thanks. we’re putting up a recipe for bun bo hue soon! Ohhhh please let me know when. That’s one of my favorites!!! What do you do with the ginger. I see it says 2 inches when and where do you use it? Hi Andy, you char or roast it along with the other aromatics (star anise, ginger, etc) and put it in with the meat to make the broth. I just got an Instant Pot and I’m determined to make pho at home! I’ve only ever made broth with bones before, so I’m a bit confused… Do you eat the meat that you used to make the broth, or is that discarded? you eat it – it’ll have the texture of the well done brisket that you usually get at pho restaurants. you could also do thinly sliced sirloin/steak too, the way you see in pho restaurants. I’m so curious–how did your parents react? 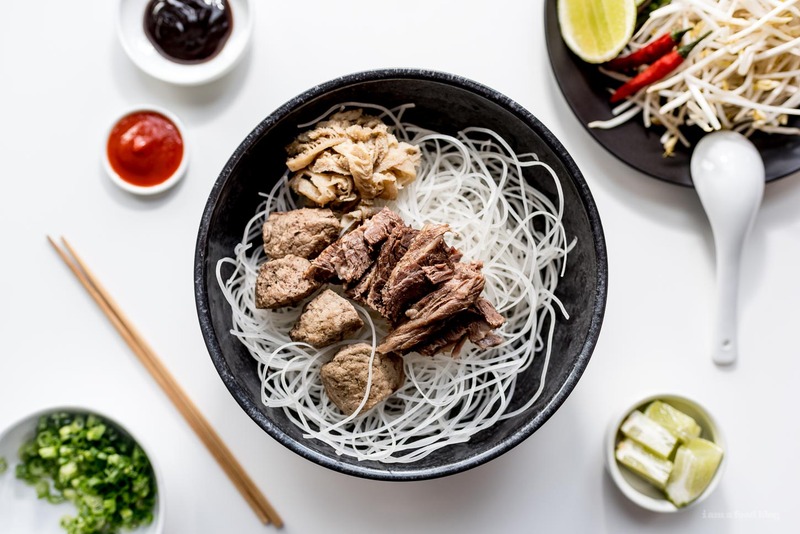 My husband loves Pho and I am so excited to make this for him! Update: I still haven’t made it for them. Hey there, thanks a million for this recipe. I literally just cleaned up the Instant Pot after making this. I did use a few oxtails along with some of those ribs you used. When it came out it was very fatty though. Like, verrry fatty. Really affects the flavor in a not pleasant way. I’m chilling it overnight to try to scrape off a layer. I can’t even taste test it to add in the fish sauce. I did add 1 tablespoon for now, but I’m afraid of overdoing it so I’ll wait until I can lower the fat and warm it back up and add in fish sauce as needed. Any other suggestions? It’s smells great but the taste is just off right now so I can’t really tell how good it is yet. Thanks again! Hey Frank, I think you’re absolutely on the right track with chilling it overnight and waiting until tomorrow to season. My only advice is to take out all the solids and strain it before you chill it to make life easier for yourself tomorrow. Do you have suggestion re: a fish sauce measurement? I am not feeling confident enough to experiment. It’s an unknown ingredient to me. Also, what would your sub measurement be for the use of a standard grind of sugar? 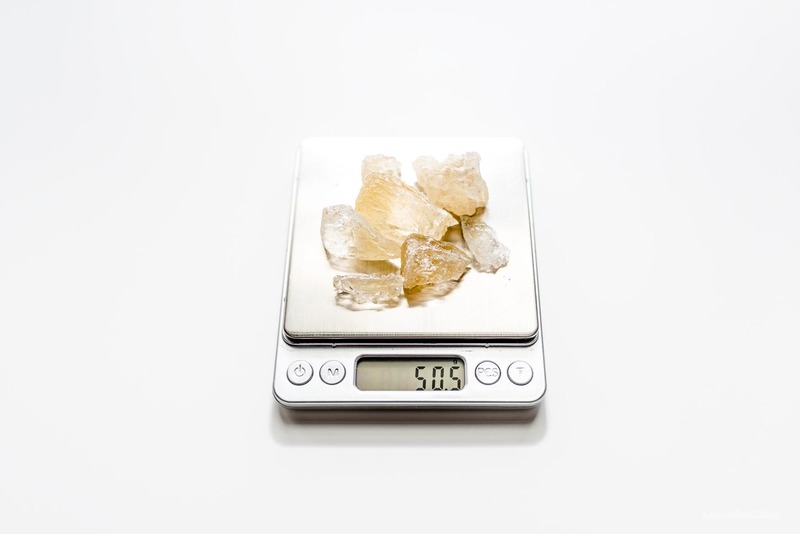 Does rock sugar have a different flavour? I used half a bottle of fish sauce and it still was a little undersalted. This looks amazing! Can’t wait to try it out. What size instant pot are you using? We have an 8qt and a 6qt. – We used about 3lbs of beef soup bone, but we don’t think it was beefy enough. Perhaps the bones comprised too much of the weight. We might do 4 or 5 lbs of soup bone next time. – We felt that it was just a bit watery initially, so we simmered the broth after pressure cooking until we hit about 2/3 of the fill line. When you say “water to the fill line”, which kind of instant pot is that for? There are 4, 6, and 8 quart instant pots now. – We didn’t have a blow torch, and I think we should have more aggressively toasted/burnt the spices before adding. To others about to try this recipe: don’t be afraid to burn your spices and onion a bit! I might even try toasting the ginger next time too, but I might need a blowtorch to get the results I want there in particular. How much water for the 8qt? Any guess? Hey Jason, sorry for the slow response, try about 3/4 to the max fill line. It’s approx 6 quarts of water or just fill to the max fill line on your instant pot. The ginger gets charred and thrown in with the rest of the aromatics. When adding the aromatics and meat to make the broth, does the “meat” in this case refer to JUST the 1kg Beef, and NOT the toppings (sirloin/brisket/meatballs etc)? With that being the case, the meat for toppings would need to be prepared separately? Hi Amanda, the meat refers to just the 1kg beef. Most of the toppings should simply be heated in boiling water when you are ready to serve – with the exception of brisket and flank, which need to be cooked for longer and can be cooked with the 1kg beef in the instant pot if you would like. I can’t have sugar but want to make this for me and someone else who can. Can I make the broth take some out for me then add sugar or does it need to cook with the broth the whole time? Hi Bobbi – you can definitely add the sugar in later. Bring the extra portion of broth back up to a boil after you’ve added the sugar to dissolve it. Sugar should be added to taste so if you can’t taste it, you might want to have someone else double check after you’ve added all the seasoning. How long am I supposed to char the aromatics? I have to use oven broiler. I have never charred anything before. How long am I supposed to char the aromatics? I have to use oven broiler. What will the broth taste like without the fish sauce? Is it necessary? It’s not totally necessary, you can use salt instead to season, but you’ll be missing out on a lot of umami. It sounds like you’ve never tried out fish sauce before, and if so I’d go salt, but if you want to take a leap, this fish sauce is good and easy to find at any grocery store. I notice you didn’t even blanch the beef for the broth. Wouldn’t it make the broth cloudy and not as clear? I’m going to have to make this. There’s a Hmong restaurant about an hour from me that makes wonderful pho, but too far away to have on any regular basis. Besides, I needed more recipes for my InstantPot. Hi, Steph! I just made this tonight and loved it. The husband did mention that there was something that was “missing”, that kept it from tasting like good old SGV or Westminster pho. He felt like it was msg? I really don’t like adding msg to my dishes…is there anything I can do to deepen the flavor without adding it in? Thanks! hi! i would season it with more fish sauce and sugar! fish sauce will definitely add more depth of flavor and you’d be surprised how much sugar will help too. hope that helps! Hi. I’m making the pho right now and scoured the San Jose area looking for beef finger meat without any luck. I love the idea that I can just put in meat rather than the bones, so there is much less issue of having to put it into the refrigerator to “defat” it. That being said, can you recommend two or three other types of beef to use if I never am able to find the finger meat? Also, I put the spices and sugar in a cheesecloth bag. Is that what you recommend to do so that you wouldn’t have to strain it? Try a flank steak or brisket, or failing all that, a chuck roast.